After gaining an honours degree in English and Drama at Bristol University, Lindsey started work as a Training Co-ordinator with Zurich Financial Services, whilst also teaching at a youth theatre. 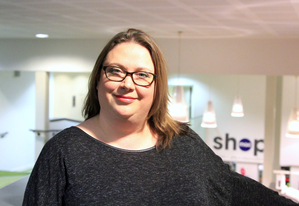 She has worked at mac birmingham (Midlands Arts Centre) since 2001 as both a marketer and drama tutor, conveniently pausing to start a family in 2008 whist mac underwent a £15.2m redevelopment. Having also used this time to work at Warwick Arts Centre, Lindsey is an experienced arts centre marketer, also taking on the remit to manage sales and deliver commercial campaigns for mac’s Trading Company. She is fascinated by the impact of an arts centre on its community, and is passionate in her belief that everyone has the ability to be an artist. She loves working in a multi-disciplinary venue and can’t understand why anyone would want a job where you do one thing at a time.